My love for cooking and eating stems from growing up in a family that lives to eat widely and plentifully. When I was a child, my mother’s pineapple tarts – still the benchmark against which I measure all others – were beloved not only for her generously spiced and artfully caramelized pineapple jam (I’ve always been puzzled by the pale yellow versions I’ve tasted, hers always had a mouthwateringly deep burnished hue), and sinfully buttery pastry, but for her generous mounds of filling. Family friends referred to her tarts as ‘Dolly Partons’. My mother has always been a maximalist at heart. And it is her generous spirit in the kitchen (as far as I can remember, we’ve always had guests at the dinner table and none were ever allowed to leave before they were well over-fed) that has fueled my own penchant for sharing the fruits of my kitchen labors. However, more recently, my mother-in-law has also become a great source of culinary inspiration. I’ve never actually tasted her cooking. She decided to hang up her apron years ago. But her two sons continue to rave about her char siew noodles, duck porridge, cheese burgers, banana cake and many other specialties. I was surprised (and delighted) to discover that although CH spent his formative years in the US, his comfort foods, the ones his mother constantly fed him, were very similar to the ones I grew up with in Singapore. Call me sentimental, but my mom-in-law has inspired me to master the dishes of our childhoods (CH’s and mine) because I’d like to be able to give our children the same kind of gastronomic memories she has given her sons, ones they’ll cherish always, no matter where we may choose to bring up our family. It was with this intent that I attempted her banana cake recipe. Of course, for CH, my learning his mother’s recipes is also the only way he gets to taste those foods of his boyhood. I’ll have to admit that I’ve put off trying to make this banana cake for years because trying to live up to a treasured memory is often a recipe for disaster. Banana cake is an easy enough thing to bake, but recreating the one your mom-in-law used to make just the way your husband remembers it really is a daunting undertaking, especially if you’ve never actually had the chance to taste the original. It’s like trying to recreate someone else’s experience of falling in love for the first time. It just isn’t something that a person in her right mind would attempt. Nonetheless, last week I decided to give it a go. I had a few ripe ang bak chio (red-fleshed bananas) that my fruit guy had given to me earlier in the week. They were sweet and fragrant without being overly mushy, making them ideal for banana cake. The toughest decision I had to make was to pick out which of my mother-in-law’s three sets of handwritten notes in her Singapore Cookbook I would follow. Accustomed to making small batches for a nuclear family of two (that’s excluding our two greedy golden retrievers), my palms got sweaty as the assembled cake batter started looking like it could feed an army. 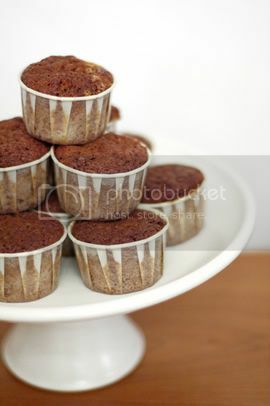 I fretted over how much batter I ought to fill each muffin cup with. What if they overflowed? The recipe didn’t even state the size of the baking tin required. O, how I missed the painstakingly detailed instructions of Baking Illustrated right then. I could only start breathing a little easier after the little cakes were inserted into the oven and the familiar intermingling aromas of banana, vanilla, butter and sugar filled our home. Then, I felt loved and loving. I felt hopeful. Success felt well within my reach. Yet it bothered me that the recipe called for the cakes to be baked for an hour. As their tops grew darker I worried that they’d get burnt. But I’d decided that for my first attempt at this recipe I’d stick closely to the instructions. Perhaps this was what made her cake different, I thought to myself. So against my better judgment I waited with great impatience for the hour to pass. Just out of the oven, they tasted gloriously moist and deliciously sweet. CH was deliriously delighted with them and tried to sneak as many as he could into his mouth. But conscientious as I always try to be, I offered a few to my mother-in-law in the hope that she would give me some feedback on my rendition of her recipe. Wonderfully honest (yes, I mean that), she tasted them the day after and declared them a little too dry – which they indeed were after they’d cooled. Imagine my embarrassment. I couldn’t even get a simple banana cake right. What kind of mother will I be? Undaunted, I purchased another comb of bananas. I am waiting for them to reach that point of perfect ripeness, when they are at their sweetest, before I make my next batch of banana cakes. Next time around, I know I’ll get the recipe right. I’ve only just noticed as I’m writing this post that among my mom-in-law’s maze of recipe notes, it says “24 cups, bake at 350˚ for 30 minutes”. I had somehow managed to miss that little detail. Boy, do I feel like an utter doofus. 1tsp pure vanilla essenceSift flour, baking powder, bicarbonate of soda and salt into a medium bowl. Cream butter and sugar until creamy white. Add beaten eggs a little at a time. Beat well after each addition. Add vanilla, milk and mashed bananas. Fold in flour and blend well. Pour mixture into muffin cups and bake at 180˚C for 25-30 minutes or until a skewer inserted into the centre of the cake comes out clean. Dear Melissa, Thank you for the encouragement! That is the cook’s perpetual dilemma, no? I will get around to giving metric measurements when I make my next batch. I personally prefer to weigh my ingredients. I’m currently using cheap measuring cups from Phoon Huat that claim that 1 cup=236ml. But I really want a set of Cuisipro measuring cups (also 1 cup=236ml) because they’re oval, which makes them much easier to dip into jars. They’re also made of 18/10 polished stainless steel (okay, I’m superficial). She recommended Oven Basics for liquid measurements and I ran out to get one. She also recommends Foley for dry ingredients but I have yet to see them on our store shelves. The Nigella ones are really handsome though (ok, so I’m superficial like that too). Thank goodness my MIL doesn’t cook. Husband’s staple diet before he met me was fish and mustard greens with occasional treats of hawker fishball. Whatever I feed him now is considered a major improvement. Hi, I know perfectly well the feeling of wanting to kick yourself for missing an ingredient or an instruction. I am often perfectly pleased with myself until I realize I’ve forgotten to add the baking soda or the yeast or something equally crucial to the recipe. A very nice story, and a wonderful thing to attempt that Im sure your husband appreciates! Oh these look great, and enhanced by a wonderful story. R: I so want the Nigella cups, too! Umami: I think your husband is plain lucky that you love food as much as you do. He gets to reap the benefits of eating well with you! Augustus: CH has threatened to sulk if I get more comments for this post than he usually does for his. Actually, Augustus, I’ve told her to start her own blog, and even registered one on Blogger for her, but she’s both too busy finishing her PHD (on the evolution of the celebrity chef) and actually getting paid to write about food to work on it. hello! i made this cake today, and it was absolutely delicious. i have to admit, i was a little afraid after mixing the batter that it might come out too dry, so i ended up adding a bit more liquid, but otherwise pure success! ps–i have those nigella cups. useless as measuring devices, but nonetheless charming…. Glad to hear that the recipe worked for you! I know what you mean re: nigella’s measuring cups. I fell in love with them when I first saw them in an Australian food mag. I’ve had the opportunity to buy them thrice in various places around the world, but have always rationalised that they’re pretty impractical. But they ARE oh-so-gorgeous. I’ve added conversions for the cup measurements in the recipe after making my second (thankfully successful) batch. Happy baking! Hi S! Been keenly reading your husband’s blog – well done, the both of you! Its great and really has inspired me to experiment more and go beyond my usual rice-and-2-dishes routine.. Anyway, more pertinently, where did you buy your cupcake cases? Too adorable! Love the idea of moist banana bites ( ooh sounds a bit pervy) rather than your garden-variety pound cake shape. Are the cases imported? I’m sorry I’ve taken so long to get back to you. I didn’t notice your comment until today. I’m assuming that you’re in Singapore, yah? The cupcake cases are from a baking supply store called Sunlik on Seah Street. Great blog! Am not a cake-fiend in general but if you’re ever around the Bugis Village area, in the newly-renovated “street-market” opposite Bugis Junction, there’s a little snack stall just beside the very-visible steamed-bun sellers by the bus-stop (yeah, lousy directions I know…) called PanCrisps, that sells these addictive cubes of luscious banana cake. They’re so perfectly balanced between fluffy and moist, and if i didn’t know better I’d swear there was an aroma of malt/horlicks in there, although u don’t really taste that. Plus, it’s not overly-sweet and those in search of a departure from heavy buttery cakes or artificial vanilla-flavoring should find this an extremely pleasant experience. Best part, it’s $1 per cube. nice blog u have! may i know where u got the cups to contain the cakes? The cupcake cases were from a baking supply store called Sunlik on Seah Street. I came across this recipe on my regular browsing through your lovely site and I just had to try it. I did and it was lovely! I would like to have your permission to add this to my blog with credit and link to your site, of course. May I? If I may, I would also like to know which method you prefer: a. should I just have a link directing readers to your site in lieu of ingredients and directions OR b. can I put the ingredients and directions in my blog? Hiya Venny, you can use the recipe on your site so long as you link back to us and credit us. Thanks! would you mind sharing the contact for your fruit guy? particularly if he supplies organic fruits? Dear S, i just tried this banana cake recipe. It works wonder! I must say i halved the sugar and added a little more than 5 tbsp of milk because i thought my mix looked alittle dry. The muffins turned out wonderfully soft and fragrant. I know my muffins are hot stuff when everyone in the family wanted to bring some for their friends. I have been trying to find a great Pineapple tart Recipe.. do you have any to share? Hi Irin, I hope you enjoy the banana cake 🙂 I’ve been planning to share the tweaks I’ve added to it in the years that I’ve been using it some time. Unfortunately, I’ve yet to hit jackpot on the pineapple tart front. My favourite tarts are the ones my mom made when I was a child. She has since made her tarts healthier and they’re no longer the same. You’ve just reminded me that I need to bug a friend’s mother to let me watch her bake her tarts this year! I would love to say this sounds delicious but I cannot face anything cooked with banana after getting a stomach bug once – and the last thing I can remember eating prior to getting the bug was… banana cake. Isn’t funny how silly little things like that can affect the way you feel for years. I had a similar experience with canned pineapple served on a Hawaiian pizza. To this day, I cannot eat Hawaiian pizzas. Just want to let you know, this is a fantastic recipe that lended itself so well to my tweaking, lol I’ve made it a few times now….I’ve made it gluten free by replacing the APF with a blend of sweet sorghum, tapioca, rice and glutinous rice flour with xanthan gum. The texture was beautiful and light. I’ve reduced the sugar today to 70g and added soft dates (100g) to butter. And I also tried cooking half the batter in my rice cooker ( cake mode) and it also turned out brilliant!!! I’ve added dark chocolate chips to it, I’ve added layers of ceylon cinnamon and it always turns out spectacularly delish and has the perfect lightness. Thank you so much for sharing such a great family recipe. Wow, you’ve truly made it your own 🙂 Glad you liked it.